Updated! Now available online for free. But subscribe anyway for the karma! Get your Lightspeed subscription now! 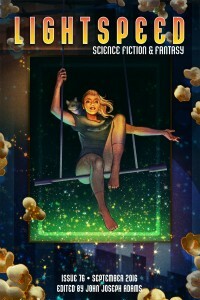 Issue 76 contains a brand new Twinmaker story, “The Lives of Riley”, along with stories by An Owomoyela, Charlie Jane Anders, Alec Nevala-Lee, Maria Dahvana Headley, Jaymee Goh, Tim Pratt, Christopher Barzak, Peter M. Ball and Nisi Shawl. A truly bumper edition! “The Lives of Riley” is a Twinmaker story that uses romance and rivalry to push ideas of identity right off a conceptual cliff. In that way it’s similar to “All the Wrong Places”, “A Giant Leap for a Man”, “The Beholders”, “Incomplete No.7″, many of the urban myths, and the entire Twinmaker series itself–but it remains very much its own thing, exploring an idea I’ve wanting to take further for over a decade. The issue also contains an author spotlight in which I talk about the writing of this “vicious gut punch” story, how I went about fitting so much into it, and in general how I write ideas-driven fiction. That dream is still alive. If he can reach the reserve facility in Brooklyn, he can pick up where he left off. But if the peacekeepers catch him they will erase him and the others without hesitation or remorse. Read more Twinmaker stories here.